Clark’s O.N.T. 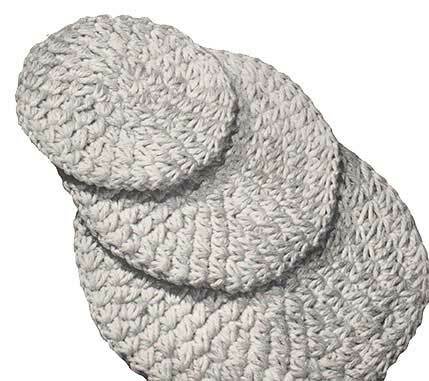 Cotton Rug Yarn or other 100% cotton worsted weight yarn, 2 balls. This amount is sufficient for a set of 3 hot plate mats. Large mat measures 10½ inches in diameter; medium mat, 8½ inches; and small mat, 6½ inches. 1st rnd: Starting at center, ch 2, 8 sc in 2nd ch from hook. Join with sl st to 1st sc made. 2nd rnd: Ch 4, insert hook in 2nd ch from hook and draw loop through, insert hook in next ch and draw loop through, insert hook in next ch and draw loop through, insert hook in same place as sl st and draw loop through, yarn over and draw through all loops on hook, ch 1 to fasten (a star st made). * Insert hook in fastening ch just made and draw loop through, insert hook in last loop of previous star st and draw loop through, insert hook in st where last loop of previous star st was drawn through and draw loop through, insert hook in next sc and draw loop through, yarn over and draw through all loops on hook, ch 1 to fasten (another star st). Repeat from * around ( 8 star sts in rnd). 3rd rnd: * Draw up first 3 loops of next star st as before, draw up last loop in top of next star st (not in the fastening ch); complete star st as before (an increase made). Make another star st, drawing up last loop through fastening ch (star st made over star st). Repeat from * around (8 increases made – 16 star sts in rnd ). Continue to work in rnds, making star st over star st and measures 10½ inches in diameter – when NOT INCREASING, work into the fastening ch’s only; when INCREASING, work into the top of the star sts as well as into fastening ch’s. Sl st in fastening ch of next star st of last rnd. Fasten off. Work as for large mat, until piece measures 8½ inches in diameter. Fasten off. Work as for large mat, until piece measures 6½ inches in diameter. Fasten off. The original publication of this pattern is in the public domain. This digital version is copyright Sarah Bradberry, July 16th 2012. All rights reserved.